Resting place	National Science Museum of Japan in Ueno, Tokyo. Hachikō (ハチ公?, November 10, 1923–March 8, 1935), known in Japanese as chūken Hachikō (忠犬ハチ公?, “faithful dog Hachikō” (‘hachi’ meaning ‘eight’, a number referring to the dog’s birth order in the litter, and ‘kō,’ meaning prince or duke)). 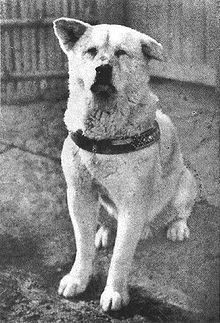 Hachikō was an Akita dog born on a farm near the city of Ōdate, Akita Prefecture, remembered for his loyalty to his owner, even many years after his owner’s death. This continued for nine years with Hachikō appearing precisely when the train was due at the station. In April 1934, a bronze statue in his likeness was erected at Shibuya Station ( 35°39′32.6″N 139°42′2.1″E35.659056°N 139.700583°E), and Hachikō himself was present at its unveiling. The statue was recycled for the war effort during World War II. In 1948 The Society for Recreating the Hachikō Statue commissioned Takeshi Ando, son of the original artist who had since died, to make a second statue. The new statue, which was erected in August 1948, still stands and is an extremely popular meeting spot. The station entrance near this statue is named “Hachikō-guchi”, meaning “The Hachikō Exit”, and is one of Shibuya Station’s five exits. The Japan Times played a practical joke on readers by reporting that the bronze statue was stolen a little before 2AM on April 1, 2007, by “suspected metal thieves”. The false story told a very detailed account of an elaborate theft by men wearing khaki workers’ uniforms who secured the area with orange safety cones and obscured the theft with blue vinyl tarps. The “crime” was allegedly recorded on security cameras. A similar statue stands in Hachikō’s hometown, in front of Ōdate Station. In 2004, a new statue of Hachikō was erected on the original stone pedestal from Shibuya in front of the Akita Dog Museum in Odate. Each year on April 8, Hachikō’s devotion is honored with a solemn ceremony of remembrance at Tokyo’s Shibuya railroad station. Hundreds of dog lovers often turn out to honor his memory and loyalty. 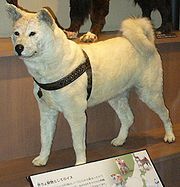 Hachikō exhibited at the National Science Museum of Japan in Ueno. 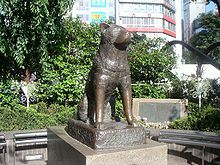 Hachikō was the subject of the 1987 movie Hachikō-Monogatari (ハチ公物語, literally “Hachiko’s Tale”? ), which told the story of his life from his birth up until his death and imagined spiritual reunion with his master. Considered a blockbuster success, the film was the last big hit for Japanese film studio Shochiku Kinema Kenkyû-jo. Hachi: A Dog’s Story, released in August 2009, is an American movie starring actor Richard Gere, directed by Lasse Hallström, about Hachikō and his relationship with the professor. The movie was filmed in Rhode Island, and also featured Joan Allen and Jason Alexander. Hachikō is also the subject of a 2004 children’s book named Hachikō: The True Story of a Loyal Dog, written by Pamela S. Turner and illustrated by Yan Nascimbene. Another children’s book, a short novel for readers of all ages called Hachiko Waits, written by Lesléa Newman and illustrated by Machiyo Kodaira, was published by Henry Holt & Co. in 2004. Hachiko Waits was released in paperback by Square Fish (an imprint of MacMillan) in 2009. Hachikō is featured prominently in the 2008 novel The Story of Edgar Sawtelle by David Wroblewski. The novel revolves around the extraordinary relationship between the title character, his family and the dogs they raise. In 1994, the Culture Broadcasting Network (CBN) in Japan was able to lift a recording of Hachikō barking from an old record that had been broken into several pieces. A huge advertising campaign ensued and on Saturday, May 28, 1994, 59 years after his death, millions of radio listeners tuned in to hear Hachikō bark. This event was testimony to Hachikō’s continuing popularity. In the Futurama episode, “Jurassic Bark”, Fry finds the fossilized remains of his dog, Seymour. Given the chance to clone him, Fry takes it, but stops the cloning process mid-way through, believing that Seymour would have forgotten about Fry after he was frozen. It is revealed at the end of the episode that Seymour waited for Fry to return from his delivery for 12 years until his death. Kesetiaan yang tulus sampai ajal tiba, apakah manusia masih mempunyai makna kesetiaan seperti itu ?????? Can’t wait to see this film! I really want it to be as good as all the reviews say. Craig has to be one of the best Bonds and I really like Bardem in No Country for Old Men.